Going to a private university in the city with the most college campuses and with one of the highest tuitions means Boston University students are a thankful bunch. Check out these students from first-years to grads who are grateful for everything from social media to professors and dining halls. I'm thankful that I have an amazing group of friends at BU who have become family, for Skype because it allows me to keep in touch with friends who are far away, and for Pinterest because it allows me to pretend I'm a domestic goddess without the actual cleaning, sewing, and peach canning. I'm thankful for tons of stuff, but mostly friends and those nice people that let you play with their dogs on the street. And family. And Goldfish. In terms of the university, I'm thankful for continuous academic challenges and faculty members that make those challenges worth it. I'm also thankful to the dining halls for stocking Goldfish. I'm thankful for the incredible faculty and staff of this university that keep my mind thinking and my heart happy. When you live over 2,000 miles away from home, it's nice to know that other adults are here to look out for you and bring you down to earth when you need it. I'm thankful for the absolutely amazing people I've had the opportunity to meet and can now call my friends. I'm also incredibly thankful for all of the experiences I have had and the growing I have done as a person while being at BU. Lastly, I am very thankful for gum. I have no idea what I would do without it. I'm thankful for a [dorm] that makes me feel home. Also, I'm thankful for the Starbucks in the student union being on dining points so it makes me feel like I'm just spending fake money. I'm thankful for my great A Cappella group the Treblemakers! I'm thankful for all the perks we get like the Elie Wiesel lectures, the former executive producer of sesame street lecture, all of the other College of Communication speakers we get to see, and the free movie/tv pre-screenings! I'm thankful for the view of Commonwealth Ave. from my window at sunset, the all-day pancakes in the dining hall on Sundays, and most of all for the multiple cuddle sessions I have everyday, because that is just the best part about college. 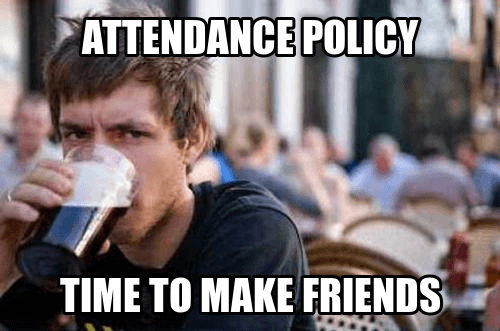 I'm thankful for lectures that don't take attendance… just kidding! I'm thankful for professors who tweet helpful hints about the exams!